The payment term of the debtor is set in the “Pricing & Terms” tab of the Name profile. 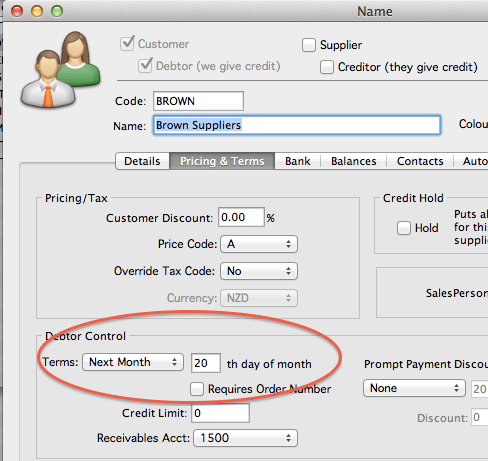 You can select either “Next Month” or “Within Days” from the Terms drop down list at the Debtor Control section. Next, enter the number of days in the field box provided next to the Terms drop down list. This will allow MoneyWorks to calculate the debtor ageing based on the payment terms set. 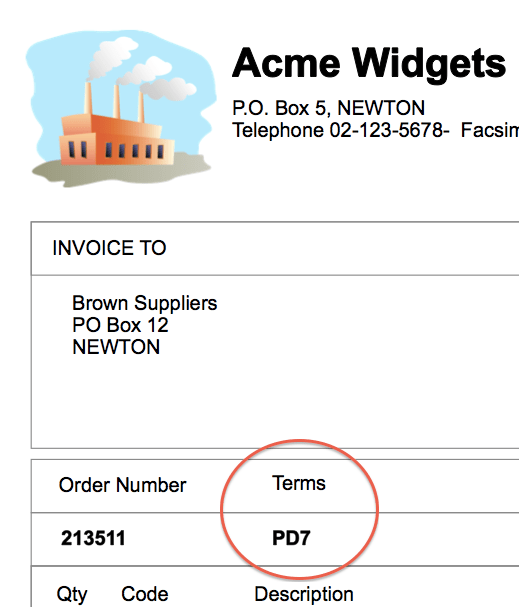 Instead of printed as 7 or 14 days payment terms in the Sales Invoice, sometime, you may want to show as PD7 (7 days Post dated cheque) or PD14. Since MoneyWorks only accept numeric in the Payment Terms box, you can’t have PD7 or PD14, which is an alphanumeric format. In this case, you may consider to use either a Category field or Custom field to record the “Payment Terms” for printing on the Invoice. For example, you may use “Custom1” field in the Name profile as a “Payment Terms” for printing of invoice instead of the actual Terms set in the Debtor Control section. Note: Using Custom field as a payment terms will not calculate the ageing. Ageing Calculation is still using the Terms set in the Debtor Control section of the Name profile. 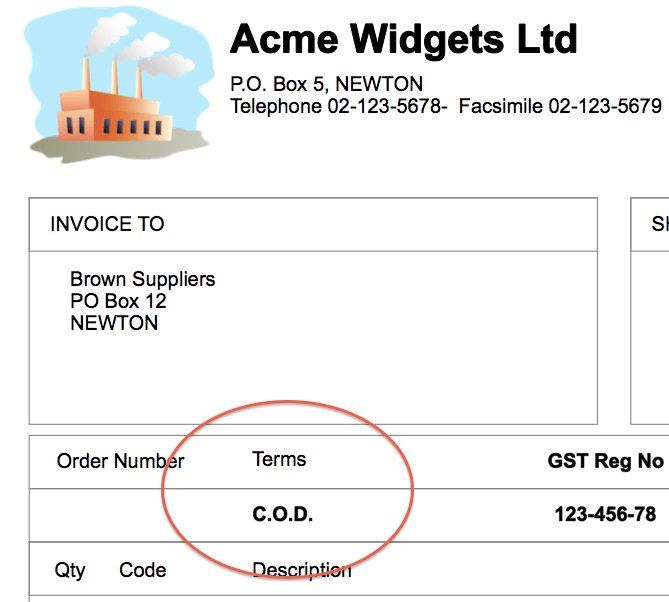 In your invoice template, add a new Calculation field and enter Name.Custom1 into the calculation box. 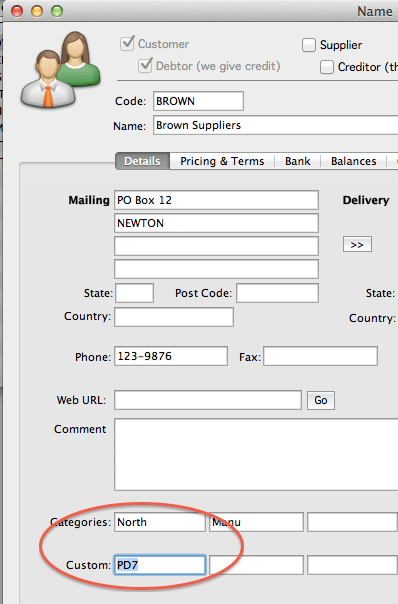 This will allow MoneyWorks to print the Name.Custom1 field onto the invoice. Then, you need to amend the template by adding an If() function into the Payment Terms field. 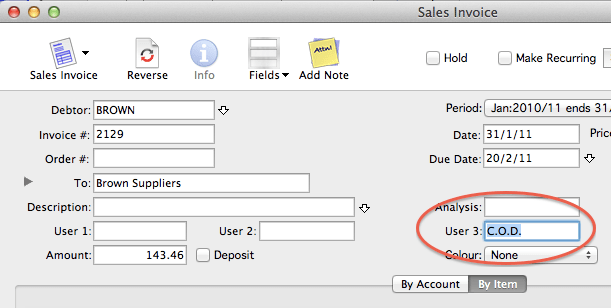 The If() function above is to search the Transaction.User3 field. If Transaction.User3 field is empty, (“”) print field data from Name.Custom1, if Transaction.User3 is not empty, then, print field data from Transaction.User3. These changes are just “cosmetic” and it will not affect the ageing calculation, please check with your accountant before implementing in your business as it will affect your ageing reports. This entry was posted in Accounting, MoneyWorks, MoneyWorks v6 and tagged accounting software, Accounts Receivable, mac accounting software, MoneyWorks, MoneyWorks Singapore, Singapore, Small Business Accounting Software, software, Templates. Bookmark the permalink.